There’s one source of clean energy that could power the earth for an unlimited amount of time: the sun. 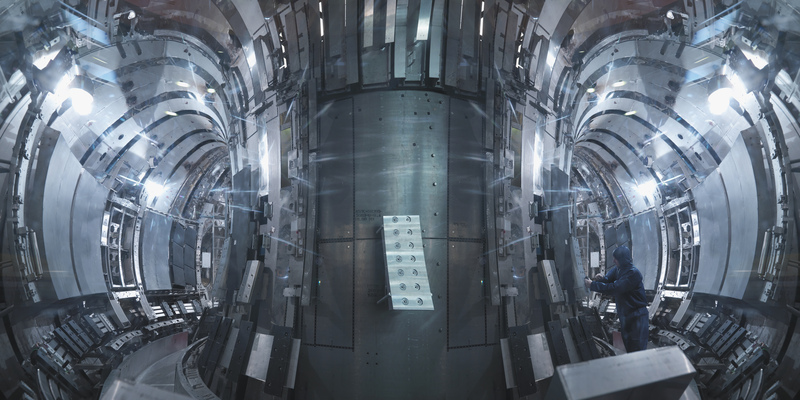 Unfortunately, harnessing its power through fusion has proven to be a daunting, near-impossible task because there have been no materials that could survive the conditions at the core of a fusion reactor. Until now. Researchers at the Texas A&M University College of Engineering have discovered a way to make materials for possible use in future reactors. The sun makes energy by fusing two hydrogen atoms into helium atoms. Unfortunately, helium damages the materials needed to make a fusion reactor, accumulating and destroying metal. This is why Dr. Michael Demkowicz, associate professor of materials science & engineering at Texas A&M and a team of researchers at Los Alamos National Laboratory in New Mexico turned to nanocomposite solids—layers of metal less than 50 nanometers wide inserted between layers of thicker metal. “We were blown away by what we saw,” Demkowicz said. “As you put more and more helium inside these nanocomposites, rather than destroying the material, the veins actually start to interconnect, resulting in a kind of vascular system.” It’s the next step to safe fusion and to a new energy supply from the world’s oldest source. To learn more about how Aggies are changing the face of clean energy, and bringing discovery and innovation to the world, visit fearlessfront.com.